The "Girl with Peaches": who is she? 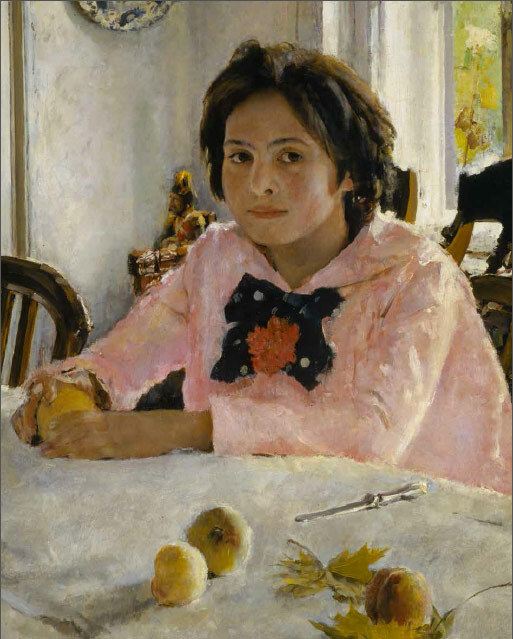 Serov’s famous painting “Girl with Peaches” depicts my grandmother Vera Mamontova in her childhood. I never met her. She died when her daughter, my mother, was only just two. During her short life she managed to accomplish everything that was expected from a woman of her milieu at that time. She was an obedient daughter, a loving sister, a bride who suffered separation from her bridegroom, a caring mother... Her surviving letters, as well as the reminiscences of those who knew her, reveal much about her life. 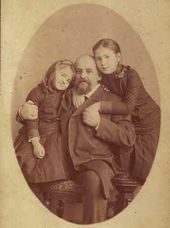 In their youth, her parents, Savva Ivanovich and Yelizaveta Grigorievna Mamontov, experienced a spiritual awakening that accompanied the national movement of the 1860s, when the best people of Russia experienced a profound anxiety about the troubles of their homeland, the peasants' lack of rights, and its weak (compared to Europe) economy, all of which put cultural, economic, and military pressure on the country. Savva Mamontov contemplated joining the Narodnik movement, but instead he and his wife, guided by their older mentors Fyodor Chizhov and ivan Mamontov, would discover a different path for building a new Russia. Drawing on his own and his mentors' ideas, Savva Mamontov went on to develop the national economy on the vast stretches of Russia from Arkhangelsk to Taganrog, St. Petersburg to Irkutsk. Working together, Vera's parents established the Abramtsevo community of artists - effectively, an academy of the new Russian culture. Thanks to Yelizaveta's initiative and efforts the community included not only professional artists but also their families. This was a commune whose members created art together, brought up their children together, and, in their free time together, played with their children and tried their hand as amateurs at various art forms: architecture, theatre, musical performance and composition, singing, and crafts - particularly pottery, carpentry and embroidery. These experiments of the immensely talented Abramtsevo amateurs developed into fully-fledged and innovative professional artistic trends. While Vera's father was building railways and factories across the different regions of Russia, her mother was creating a cozy infrastructure around the estate, an undertaking which involved peasants from the neighbouring villages, keeping them at home at a time when peasants in central Russia were moving to factory jobs in their droves. She built a church and set up a school, a medical post, and workshops - all that a peasant family could need in their home environment. 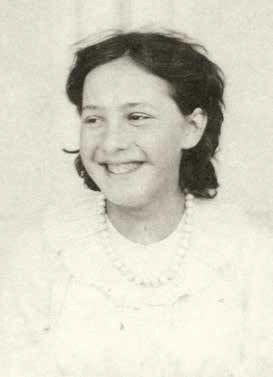 Together with her younger sister Alexandra, Vera grew up amidst the bustle of patriotic activities followed by her parents and their many friends. Yelizaveta Mamontova raised and educated the girls herself, always keeping them by her side. 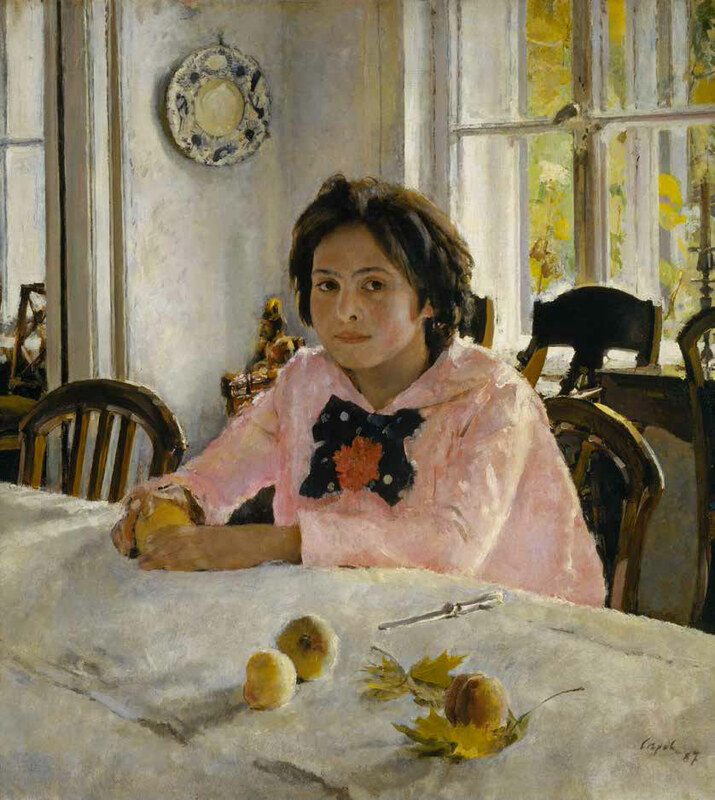 Another of her wards, brought up together with the girls' older brothers, was Valentin Serov, whom his mother, Valentina, would leave for long periods at Abramtsevo. Yelizaveta Grigorievna had a great influence on the artist. When she died, the 40-year-old Serov, grieving over her death, wrote in a letter that she was as dear to him as his own mother. The cheerful young companions often adapted each others' names, giving one another playful nicknames. 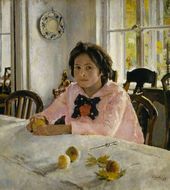 Serov was called Anton; Vera became V-e-rushka, with the accent on the first syllable, which gave it an affectionate overtone, unlike the dismissive Ver-u-shka. Vera's younger sister was called Shura and even Shurka; only Viktor Vasnetsov and his children would call her Shurenka. The letters contain vivid descriptions of scenes from Verushka's childhood, adolescence and early life. Later, she wrote in the course of travels in Europe, in Italy, Switzerland and Germany: "Until now our journey has been smooth, with everything playing out in the best possible way for us. We spent three perfect days in Lugano, with ideal weather, a soothing nature, and only nature. There, Vera got considerably better, so we didn't have to use uncture, she was absolutely fine. The journey from Lugano to Basel. surprises you at every step of the way with its wonderful sights, so many waterfalls, and those tunnels - even the memory of it makes me shudder - I could never imagine anything like that. Then her adolescence had passed: Vera turned 20 in 1895. She helped her mother in her numerous philanthropic initiatives, undertakings which took the mother and daughter to the home of the Samarins, a wealthy noble family, one of the oldest and most distinguished of old Moscow12; Slavophiles, they were deeply steeped in religion and literature, and conservative guardians of the Christian Orthodox faith and monarchy. The Mamontovs came from a different social background, and they would have never found themselves in the company of the Samarins had it not been for both families' wealth and philanthropic undertakings, thanks to which they came into contact. A serious-minded, well-educated and modest young lady, Vera Mamontova, thanks to her intelligence, the firmness of her Christian faith, and sense of culture, was at home with the young Samarins. She became friends with the youngest daughter, Anna, and over the years grew close to Anna's brother, Alexander. Vera's inner world and outward appearance at that period were captured by Viktor Vasnetsov, a close friend of Yelizaveta Grirogievna and her daughters. His letters to Vera, as well as the portrait of her he created in 1896, have survived. According to family legend, Vasnetsov, when he finished that piece, kept it for himself, saying to Vera, "I'll present it to your bridegroom, if he's Russian." He wrote on a different subject in a letter of January 26 1900, again from Moscow: "I never thought that the Pope's ceremonial service would leave such an unpleasant impression on you and give you so little. When I learned from Yelizaveta Grigorievna's letter that you were going to attend it, I expected that such an unprecedented spectacle would put you in a sublime and august state of mind. Although it is not very becoming to rejoice on an occasion like this, in my heart I'm happy that things turned out like that and that our native Christian Orthodox faith, even with respect to its trappings, proved to be loftier, purer and more artistic. I'm also happy that I have the three of you, my dear people [who are] full of vigour and strong and haven't vacillated in the least! So many Russians - and quite good Russians at that - have yielded and continue to yield to these temptations. Surviving documents include another description of Vera as she was at that time - a literary profile, from the memoirs of Yekaterina Sakharova, the daughter of Vasily and Natalya Polenov15: "The residents of Abramtsevo, in addition to Aunt Liza [Yelizaveta Mamontova] and Vera, our real Olympic goddess, included another sister, Shura: Viktor Mikhailovich [Vasnetsov] called her Shurenka. She didn't have her elder sister's good looks nor did she enjoy everybody's admiration, but she was a true friend for us in our early youth. Verushka, the beautiful Amazon, riding her own noble mount, was a true goddess. Shura was an ordinary Russian girl. Vera used to be compared to a rose, Shura to a clover from a meadow. "When she finished, a silence ensued, and after her nobody disturbed the calm of the evening and the beauty of the images evoked by her wonderful voice and fine face." 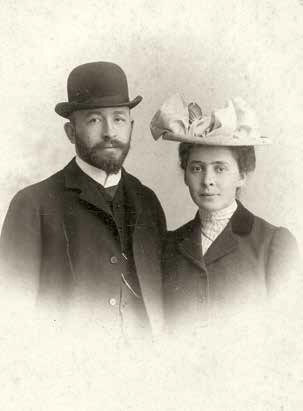 On January 26 1903, with their parents' blessing, Alexander Samarin and Vera Mamontova were married. it had been preceded by several years of anguished waiting. Already, in the late 1890s, they had decided that they wanted to be together, but the bridegroom's parents did not give their blessing: Savva Mamontov's bankruptcy in 1900 did not help matters, either. They saw one another only rarely, waiting for a turn of fortune and hoping for God's help. Finally, Alexander's mother Varvara (daughter of General Yermolov who had taken part in the 1812 war with Napoleon) gave her blessing. Their daughter Yelizaveta Samarina sensitively described that period in their life in her memoirs17. The newlyweds spent their honeymoon on Corfu, and then made their home in a mansion in the town of Bogorodsk (now Noginsk), where Vera's husband was a Marshal of the Nobility. The couple had three children in quick succession: Yury (1904), Yelizaveta (1905) and Sergei (1907). Their ties with the Mamontov family continued. 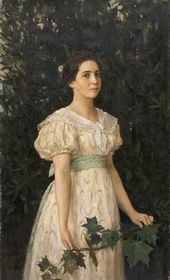 Vera wrote to her mother regularly detailed letters about her life; Alexandra visited her sister and travelled with her family to the Samarins' estate Vasilievskoe on the Volga, near Samara; in the summertime Vera with her children stayed in Abramtsevo, and Alexander, just as Savva Mamontov had in the past, would come to the family estate on the last train. He was a choirmaster, chorister and lector in the Abramtsevo church. Those were years of family bliss that the young Samarins generously shared with their close relatives, never locking themselves away in their own little family world. Their friend Viktor Vasnetsov, too, was always close. Revolutionary sentiment was growing, and Vasnetsov, together with Alexander Samarin and some others, wrote an open letter, on behalf of the Moscow nobility, to the Emperor, asking him, in order to protect the monarchy, to refrain from introducing democratic freedoms, the sole effect of which would be to encourage revolutionary propaganda and plunge the nation into chaos, which is what indeed would soon take place. In anticipation of the destruction of his beloved homeland, Viktor Vasnetsov's paintings began to feature apocalyptic motifs. Vera, of course, shared the men's views in her heart and participated in their undertakings with her intellect. In 1907, Vasnetsov presented her with a large print of his icon featuring the Saviour with a laurel wreath and streaks of blood. He inscribed it, "But he was pierced for our transgressions; he was crushed for our iniquities; upon him was the chastisement that brought us peace, and with his wounds we are healed" (Isa 53:5), with the signature, "To Verushka - V. Vasnetsov, 1907, 15th March". His words would prove prophetic about the disaster that was to come: 1907 would be the last year of Vera's life. On Christmas Eve, shopping in Moscow for Christmas presents, she caught cold, fell ill with pneumonia and a high temperature, and died on December 27. Her sudden death at the festive season caused her family immense suffering. Her mother, Yelizaveta, stepped in for the moment to take care of the little children, the oldest of whom was only just three. But she could not sustain her own grief and died ten months later, at the age of 62. Her letter to Natalya Polenova, probably her last to her old correspondent, reads: "I would want so much to see you and talk with you about many things, but I don't know if I'll bring myself around to making any move. Now, thank God, the children are better, the older ones are free of fever the second day in a row. Seryezha, too, looks a bit more cheerful today. It's been long since I last looked after children, I worry about every little thing, and I'm annoyed at myself, and memories of Vera are forever with me - how cheerfully and simply she handled them when they were sick, and of course I know that in this particular case she would have been more worried about my agitated state. I understand all this perfectly well and still cannot come to my senses. I believe that a talk with you would help me to pull myself together. As I recover from the stupor of the first days, I'm feeling ever more strongly that Vera was at the centre of my life, every thing, every place, all was full of her, and this void grows every day and you know that it will go on doing so. Fortunately, the little ones take up a lot of time, they tire you out and, so, bring sleep, which is very good. And my heart is breaking when I look at Shura and Sasha. "I wished to have a word with you, but there is nothing else I can say. I'm happy watching your darlings, I believe that I love you all even more than before. Yelizaveta Grigorievna was buried in the Abramtsevo graveyard, close to the grave of her beloved daughter. Now Alexandra was all that was left of the Mamontov "mother-daughter-daughter" triangle. 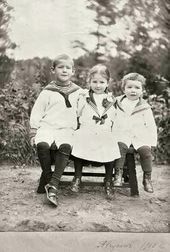 She helped Alexander Samarin to take care of the children and was like mother to them until her death; she was also a faithful sister to him, as was his own sister Anna, with whom Alexandra remained friends until that very distant time - as it would seem from the early 20th century, at least - of the 1950s, when both died at a very old age. But Vera's life, cut short by the fact of her death, continues beyond it. Russia and the world know and remember her thanks to the Serov portrait. She has lived on in her three children, four grandchildren, four great-grandchildren, and now 12 great-great-grandchildren, her mark on the Abramtsevo community of artists enduring forever. Yelizaveta Mamontova to Natalya Polenova. Abramtsevo. July 27 1881. From the Abramtsevo Museum-Reserve - hereinafter, Abramtsevo archive. Yelizaveta Mamontova to Natalya Polenova. Abramtsevo. September 12 1883. Abramtsevo archive. Yelizaveta Mamontova to Natalya Polenova. Stuttgart. April 29 1884. Abramtsevo archive. Yelizaveta Mamontova to Natalya Polenova. Abramtsevo. July 14 1884. Abramtsevo archive. Yelizaveta Mamontova to Natalya Polenova. Abramtsevo. June 27 1887. Abramtsevo archive. Yelizaveta Mamontova to Natalya Polenova. Rome. January 31 1888. Abramtsevo archive. Mamontov, S.S. 'Memoirs about Valentin Serov'. In "Valentin Serov. Memoirs, Journals, Letters of His Contemporaries". In two volumes. Editors, compilers, and authors of the preface, essays about the memoir-writers, and annotations: Zilbershtein, ilya, and Samkov, Vladimir. Leningrad: Khudozhnik RSFSR (Artist of the Russian Soviet Socialist Federative Republic), 1971. V. 1. Pp. 163-174. Vera Mamontova to Alexander Mamontov. Moscow. June 13 1891. Abramtsevo archive. Vera Mamontova to Alexander Mamontov. Moscow. January 21 1891. Abramtsevo archive. Vera Mamontova to Alexander Mamontov. Moscow. January 28 1891. Abramtsevo archive. The Samarins were descended from the nobleman and army chief Nestor Ryabets, who, around the year 1300, left Leo I of Galicia with an army of 1,700 soldiers and moved to the court of the Moscow prince. Yelizaveta Mamontova to Natalya Polenova. Abramtsevo. April 1 1895. Abramtsevo archive. Viktor Mikhailovich Vasnetsov: Exhibition Catalogue. Published by the Abramtsevo Museum-Reserve. 2012. Sakharova, Yekaterina. "The Story of My Life". Manuscript. 1967. From O. Atroshchenko's archive. From Alexei Khomyakov's poem "Stars". Chernysheva-Samarina, Ye. 'Alexander Dmitrievich Samarin'. in: "The Samarins and the Mansurovs. Their Relatives". Memoirs. Published by St. Tikhon's Christian Orthodox University. Moscow: 2001. Pp. 121-207. Mikhail Vasnetsov to Alexei Vasnetsov. Moscow. December 28 1902. From O. Vasnetsova's archive. Yelizaveta Mamontova to Natalya Polenova. Abramtsevo. 1908. Abramtsevo archive. Valentin SEROV. Girl with Peaches. 1887. 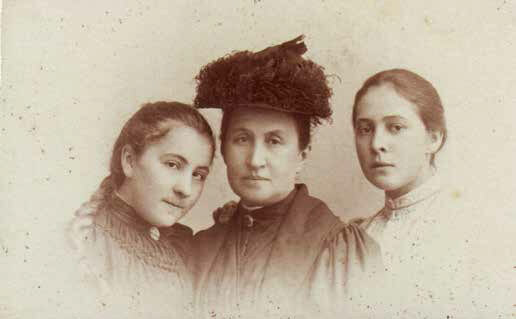 Yelizaveta Mamontova with her daughters Alexandra and Vera (right). 1884. Savva Mamontov with his daughters Alexandra and Vera (right). 1884. Alexander Samarin, Vera Mamontova. Rome, November 1902. 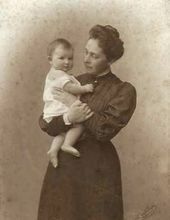 Vera Samarina with her daughter Yelizaveta. 1906.